At first I was a little excited, when I saw the envelope above in my mailbox. To see PRESIDENT BARACK OBAMA in the return address certainly got my attention! I wondered what it could be? Anything is possible. After all my daughter received a handwritten letter from President Bill Clinton, when she wrote to him back in the 90's. But I had not wrote a letter to President Obama. Maybe I was one of the ordinary people to be invited to a state dinner (yeah right)! I could hardly wait until I got home to open it, so as soon as I got in my car I looked closer and noticed the "John, can I count on you?" above my name. Then I knew it was just a solicitation for money! I thought the Presidential election was over! Of course, it is over. So WTF? Inside the envelope was this "letter" to "Dear Friend." For one, I am not a friend. If I were, the letter would be personally addressed to me. And two, it's not really from the President, or it would have "The White House', 1600 Pennsylvania Avenue, Washington, DC" on the letterhead. This is the front of the letter. I won't show the back of the letter, since it is signed by the President (not really, it's the same ink as the letter--laser printed). I don't want to be responsible for distributing his supposed signature, although I'm sure it's out there somewhere on the Internet for anybody that wants to do anything with it. (press Ctrl + a few times (to magnify the text size), if you really want to read it. In case you haven't guessed by now who it's really from, I will tell you. It's from the Democratic National Committee. I have never donated to the DNC, so I don't know how I got on their mailing list. However this is not the first piece of mail I received from the DNC. 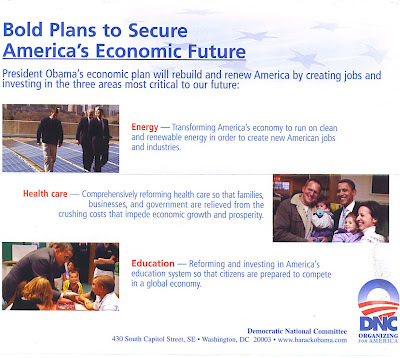 But it is the first piece of mail I received from the DNC that was disguised as mail from the President. I'm not impressed. I almost feel insulted by the desperate attention grabber they used. And since I have readers in other countries, I will explain how I most likely got this piece of crap mail. Things like this happen in the U.S., as a result of our voting system. To vote in the primary election, you must declare your party and that becomes public record. 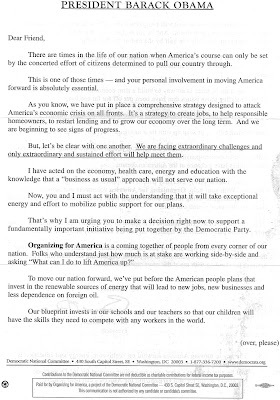 Any Democratic organization or candidate can use the list of primary voters for mailings such as this. Of course, the same goes for the other parties--Republican, Independent, etc. This colorful insert was also in the envelope and summarizes all the jargon in the letter. I mean, who is going to actually read the long two page letter? This slick summary might get read. And the meat of the unsolicited mailing was a self addressed stamped envelope and a form I only needed to fill in a few blanks with the amount of my donation and let them know if it was by check or credit card, and my credit card number. This whole thing makes me a little ticked off. Why? For one, because it was DNC mail disguised as mail from the President. And two, a famous quote from President Clinton--it's the economy, stupid! AS IF, I or any other average citizen could afford to donate money right now to the DNC or any political organization ...hahahahahahaha! Dream on! And three, we are not even in an election season yet. And four (as if I needed another reason), why on earth would I donate my hard earned money to the DNC? So they can spend it on mailings like this? That is a rhetorical question. But anyway, I will answer that one, "uh, no!" By the way, what did you find interesting in your mailbox lately? I get email spam from the President and all his people all the time. Once a day now, up to a dozen a day back during the campaign. It's easy enough to opt out if you want. If you didn't specifically put your name on their mailing list, then I'll be one of your 'friends' did it for you. Just opt out. Wow! I'd be pretty excited to find a letter adressed from barack obama! Especially since i don't live in the US! well boy, the only mail we get here is bills, hell them guys must like you lots. we mainly get them letters from those evangelist guys, bein in the bible belt an all, bess tole me to tell you, you sure is a fine lookin youngun. @Larry, this wasn't about email. Yeah, I get tons of email solicitations too. Usually I just delete them, since I know they are just out for money. Opting out doesn't always work. T. Boone Pickens didn't opt me out after I requested opt out! Try it. @Colin, Glad you understood what it was all about! Thanks for your comment. @therealbobthought, why do you think this mail stuck out so much--because I usually just get a bunch of bills! Thanks for the comment and yes you and Bess be sure and stop by again, ya hear! Thanks. @Yvette Kelly, what a hassle to vote! A lot of people here are spoiled and most would not have the patience to stand in a line that long for anything! What I receive here in the Philippines are letters from the States and Netherlands asking me to play the lottery. Everything is possible now, John. The internet does it. They know your full name name, your email, your address, your security number, everything. They can even erase your identity and make you a whole new person. This is the price of advancing technology. @estafema, hello and welcome! I hope you realize that no lottery from the U.S. would be sending out mailings, so that is some kind of fraud! I can't speak for mailings from the Netherlands, but I would be leary. A lot of people here in the U.S. get mail from the "Canadian Lottery," and it's not the real deal either! Chris Brown's new song "Changed Man"
Do BUTTS make people buy magazines?